Scanned image of E 49350 - a photograph of a broch site. Description Scanned image of E 49350 - a photograph of a broch site. Scope and Content Nybster broch, Caithness, Highland Nybster broch lies on a sheer-sided cliff promontory near Auckengill in north-east Caithness. The broch can only be approached from one direction and is defended by a massive outer wall. Outbuildings fill the whole of the promontory. The site was excavated by Sir Francis Tress Barry (1825-1907) and John Nicolson (1843-1934) in 1895-96. 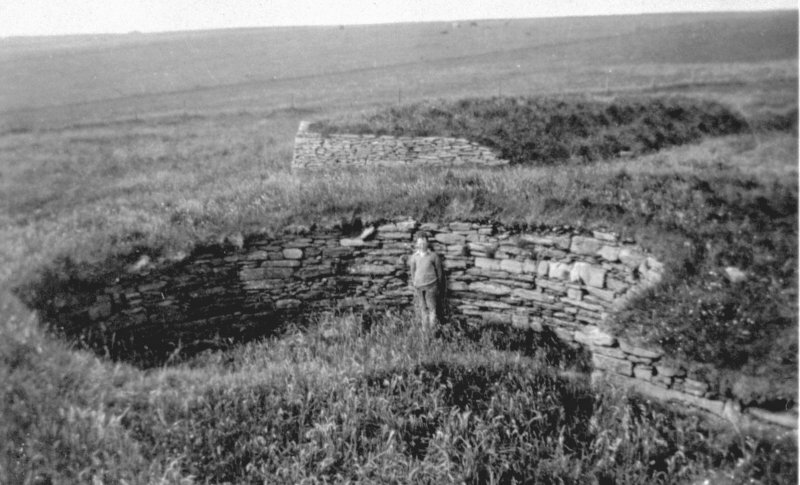 This photograph shows a small boy standing in the centre of the broch. The photograph has been taken from the east looking inland, masking the precipitous coastal location of the site. Barry and Nicolson excavated a number of archaeological sites across Caithness including brochs, cairns and cists. Barry was a pioneer of photography on archaeological sites, creating an important record of his work. A talented artist, Nicolson drew many of the sites and artefacts that were uncovered, producing an equally valuable record. Source: RCAHMS contribution to SCRAN.